Colorized scanning electron micrograph (8000X) depicting a large grouping of Gram-negative Legionella pneumophila bacteria (Source: Centers for Disease Control). Outbreaks in Legionnaires’ Disease such as the one in the South Bronx of New York in August 2015 highlights the importance of having effective biofilm control as part of your overall industrial water treatment program. Legionella bacteria grow in biofilms in building water systems, where they are protected from the disinfecting action of oxidizing and non-oxidizing biocides. The importance of biofilm control is highlighted in the following excerpt from “Biofilms: The Stronghold of Legionella Pneumophila“. “While L. pneumophila replicates within environmental protozoa, colonization and persistence in its natural environment are also mediated by biofilm formation and colonization within multispecies microbial communities. There is now evidence that some legionellosis outbreaks are correlated with the presence of biofilms. Thus, preventing biofilm formation appears as one of the strategies to reduce water system contamination” (M. Adbel-Nour, C. Duncan, D.E. Low and C. Guyard; Int. J. Mol. Sci. 2013, 14, 21660-21675). The evidence from decades of scientific research is very clear. 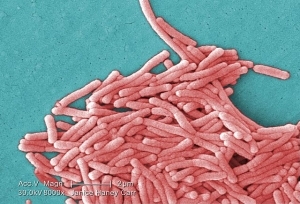 Legionella pneumophila resides primarily in biofilms in building and industrial water systems. Four important documents from the Cooling Tower Institute, World Health Organization, Center for Disease Control, and OSHA cite the importance of using a “dispersant” in conjunction with biocides as part of a clean-up and control program for Legionella. For example, BCP™ 1015 (DTEA II™) is a dispersant that has been used effectively in the hyper-halogenation Wisconsin Emergency Protocol for Legionella Cleanup and Control, and can be used subsequent to cleanup and disinfection in conjunction with a biocide in an ongoing biofilm control maintenance program for the entire cooling system. See the Legionella Control page on our website for more details on the Legionella problem and the AMSA solution.